Using materials of your choice...decorate a foam notebook to match any holiday or special occasion. Also a great party activity. 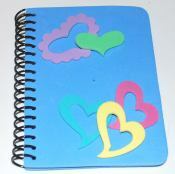 Notebook with foam covers available at most crafts stores or Walmart in singles and packs. Select your notebook and theme. Peel and stick the stickers selected or glue on foam cut outs. Use craft glue to adhere items like rhinestones. Decide on a theme first and talk about the stickers selected. Lay them out so your child can pick. For a young toddler let them pick a set number of stickers. Great as a make and take party activity. Some stores or Amazon will have stickers and notebooks in packs for better pricing. Brush paint on stamps and press. We used Ceramcoat paint which comes in little containers in a dozen colors. Washable when wet, permanent when dry. You might do a couple test prints to see how much paint is required. Do not put too much paint.